Baby Wall is 35 weeks along today, and we had another ultrasound. He/she was weighing in at 5 and a half pounds and still charting along to arrive on the 27th. My doctor has the faux due date of January 1, but that is just not happening. I repeat, not happening. Alex thinks that Baby Wall would come between the 25-29 and I don’t really support that plan either. I would enjoy a December 20th due date. Early enough that it will not interfere with Christmas, but still late enough to give plenty of time for Baby Wall to cook. I realize I have no control over any of this, which more than likely makes me want to exert MORE control. Here is a very blurry picture of Zachary/Caroline’s face. 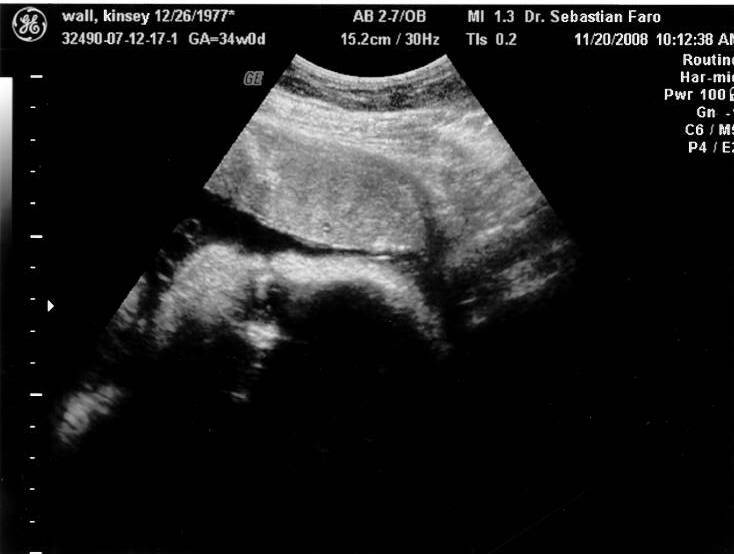 He/she is laying on his/her left side, so the bright spot in the center is the nose. Yes, I realize it is a terrible picture…and it was the best of the 3 that were taken. Really it just looks like a bunch of fuzz, enjoy. Beautiful names!!! Especially your girl’s middle name. 🙂 He or she will be here before we know it! I guess I’ll get everything monogrammed with ______ JW and we can fill in the blank with a sharpie.